Headset for cordless phones lets you multitask at home or on the road while enjoying clear conversations. Noise-canceling microphone adjust switch optimizes sound. Adjustable headband is comfortable enough to wear all day. 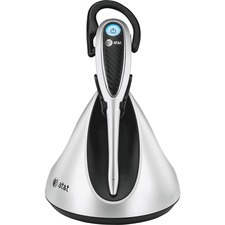 Simply plug into existing cordless home phones and mobile phones that have 2.5mm ports. Headset includes one-touch inline volume and mute controls. Enjoy wireless freedom while seamlessly managing PC, mobile and desk phone calls with a single intelligent headset system. Three-way connectivity, convertible headset offers up to a 350' of wireless range from the charging base. It is ideal for office professionals who use multiple devices and require best-in-class sound quality for their business communications. 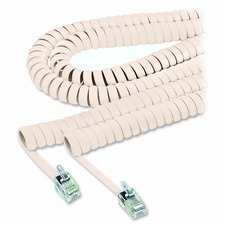 It automatically routes mobile calls to the mobile phone or headset - whichever device is within easy reach. Transfer audio between headset and mobile phone with a press of a button so you can leave the office and take the call with you. Using advanced DECT wireless security, Savi 700 series headset keeps conversations safe and secure. Eight discreet security measures, including a 64-bit encryption, mean confidential information remains private. Headset features one-touch call answer/end, volume control, mute and flash. 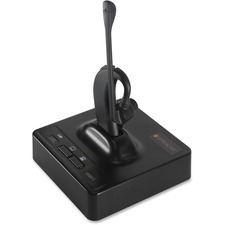 Pair this cordless accessory headset wirelessly with many AT&T DECT phones, including the Syn248 or SynJ business phone systems. Headset delivers up to 12 hours of hands-free talk time and crisp sound quality. DECT 6.0 digital technology offers a range of up to 500' to maximize mobility and provides superior quality of voice and sound, high protection against wiretapping while not interfering with wireless routers. A magnetic charger in the cradle ensures the headset fits and charges securely so you'll never run out of battery during long calls. 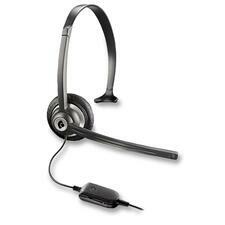 Lightweight and comfortable, the headset offers multiple wearing styles: over the ear, over the head or behind the neck. Design also includes easy one-button answer; dual-color, lighted in-use indicator; sound level protection; six-level, audio volume control; ring-volume control and mute controls. 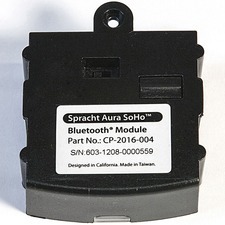 Bluetooth Adapter Module is designed for use with the Spracht Aura SoHo Full-Duplex Analog Conference Phones. Module plugs right into SoHo accessory Bay with no software required so you can conference calls using any Bluetooth Device. Wireless headset features eco-DECT technology to provide a safe output of power with minimal emissions while delivering high-quality audio. Headset adjusts the radio frequency in four steps depending on the distance between the headset and the base. The closer to the base, the lower its power output. Light, flexible over-the-ear style ensures all-day comfort. Noise-canceling microphone reduces background noise to prevent any distractions during an important call. 500' range lets you roam freely for complete mobility. Long-lasting battery provides up to nine hours of talk time so you never drop a call. 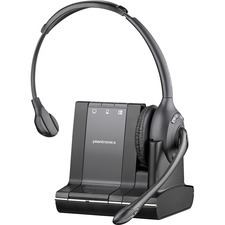 Headset also offers conference calling, consultation hold function, out of range indication and more. Headset is compatible with VoIP platforms including Microsoft Lync, Skype for Business, Skype and more. Universal tablet padfolio gives you the flexibility to use one case for countless brands and models of tablets and eReaders. 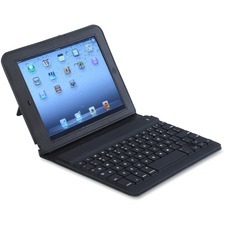 Tensioned clips securely hold virtually all brands of 8-1/2" to 11" tablets and eReaders. Multiple viewing angles are easily adjustable to provide the best display in any environment. Notepad provides a convenient area for quick notes. Slip pocket holds loose papers while allowing easy access. 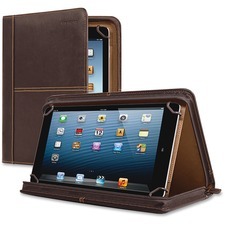 Padfolio also features a business card pocket, pen loop, full-grain leather body and zip-around closure. 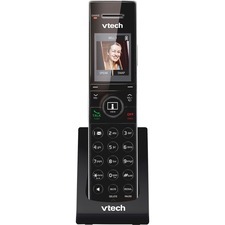 Accessory handset expands the Vtech Audio/Video Doorbell Answering System that combines a versatile phone system with a digital camera for convenience and security at home. Like Caller ID for your front porch, the video doorbell allows you to screen visitors before answering the door, without the worry of being seen by connecting to a wireless camera (sold separately). You can then stream video, audio or both with just two buttons. Save up to 100 photos. Handset also features DECT 6.0 digital technology, 1.8" color display, backlit keypad, Voice Announce Caller ID, Push-to-Talk, HD Audio, speakerphone, up to 14 minutes of digital recording time, Quiet Mode, 50-name/number Caller ID history, intercom between handset and the base unit (sold separately), conference between an outside line and up to two cordless handsets, call screening, call intercept, remote access, message retrieval from headset, message time and date stamp. Set the handset on a table or mount it to a wall. With an ultra-slim design and integrated case, this folio case for the iPad Air delivers stunning ingenuity for the ultimate mobile experience. The 70-key keyboard is Bluetooth 3.0 compliant and offers you a better way to type when writing emails, browsing the web, taking notes and more. The integrated silicone case protects your iPad Air against accidental drops and prevents scratches from occurring.